Port / Container Terminal Experience Mandatory. GCC Experience preferable. With experience required in GRP (Glass-Fiber-Plastic) / Experience in Yacht-Plane industries. 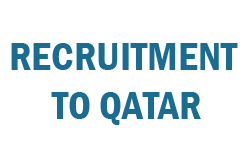 Salary will be 1800 QR – 2000 QR + Food Allowance 400 QR or company provided food. Holding valid / Expired Qatari Driving License. Salary – 2000 QR – 2200 QR + Food Allowance 400 or company provided food.